Anyway, these three windows are in the worst condition in the house…long neglect combined with the southeastern exposure have significantly damaged these windows. 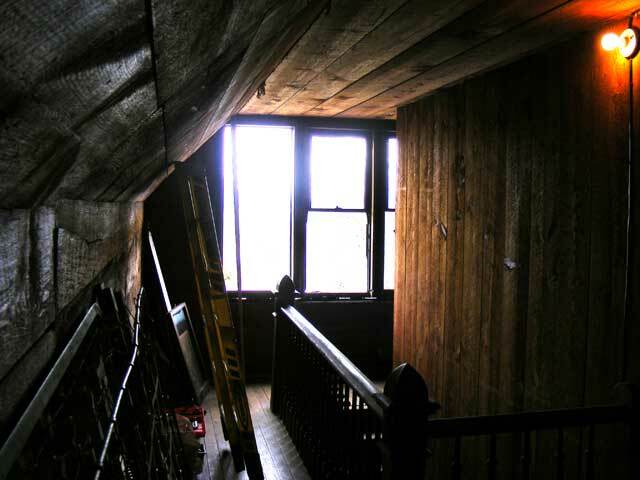 I am eliminating the sash weights in this set of windows due to the construction around them (the weight pockets are a complete attic! …the heat/air loss and air penetration for each one of these is significant and difficult to correct here. Jamb kits can support the windows AND provide nice weatherstripping. The simpler jam kits are kind of cool because there is little alteration to the sashes or frames yet I get a tight air seal and window “balancing”. They are also affordable (relatively) and once the trim is in place, unobtrusive. These windows in particular…are “double sash”…as in both sashes move…but the top sash is not “hung”…no weights/pulleys. (not sure why). You can drop the top sash all the way, well, except for the fact the top sashes have all failed and need re-glued and the glass re-glazed…or open the bottom window all the way (it holds up the top sash?). Weird. Not ideal (all the other windows are actually double hung). Not sure how these were actually supposed to operate. There’s no evidence of pins or such to hold up the top sashes. The jamb kit can fix all this…seems a good fit for the smaller upstairs windows. But of course, all these windows…I want to be sure…so I ordered ONE…for the worst window in the house…just to test…to see how it’ll work, durability, installation, looks, function, etc… After-all, I can always pull it back out and try the tape balances instead if I want…there are also other, more expensive but “feature-full” jamb kits. Heh…never got even close to installing it. The exterior sills are completely shot…at some point somebody had screwed tin over the already weathered sills…but no caulk or sealing…so it just managed to make it rot that much more. My Dad and his wife (Hi Jean!) were up this weekend to help. Me and Dad attacked the windows, while Jean and Carey attacked the dust monster that has been living in the second floor for a couple decades. There’s some truly obnoxious colored deep shag carpet that they removed…when placed in the sun the color was even more…stunning…radioactive even…but that’s subject for yet another post. Dad and I were just going to remove a set of sashes, install the jamb kit, repair the sashes, prime and caulk and paint the whole mess. Instead, We’ve removed part of an (extra) wall to get to the set of windows, removed all the sills (internal and external), removed the underlying rotted framing, and then boarded the whole thing up. Enough is enough for one weekend. The wife must think I’m nuts…she knew I was just headed up to remove a set of sashes…and now we’ve got a 5×7 foot hole in the wall. I told her the crowbar slipped. I’ll put it back together next weekend. Gotta find some rather…specific…sized lumber and make some complicated cuts to make the two different, one-piece-but-spans-three-windows-sills and underlying framing. We did cut one…but there’s a problem in how we measured and though it “would do”, I expect I’ll be doing it over to get it right. go before this mess is fixed.